I think this is it. I think I'm finally admitting that I will not get this finished by tomorrow. I am just 32 rows off starting the v. That doesn't sound like an awful lot, but I'm only getting through around 4 rows in 30 minutes, what with untangling and whatnot. 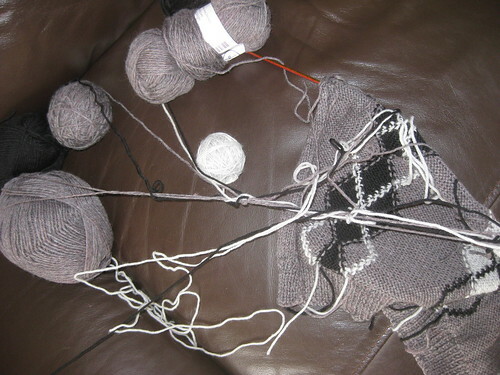 So that's still 4 hours of knitting. Stupid little things like eating, work and sleep have conspired against me. It should never have come down to this, I know. I bought the wool at Christmas, which is loads of time to knit a vest top. 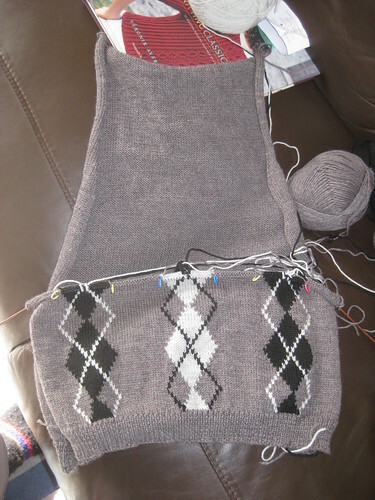 Still, progress made, and I should have it blocking by Monday evening. Today's progress shot is nearly far enough off to get me to throw in the towel. Nearly. I've laid it out on the back, to illustrate how much further there is to go. 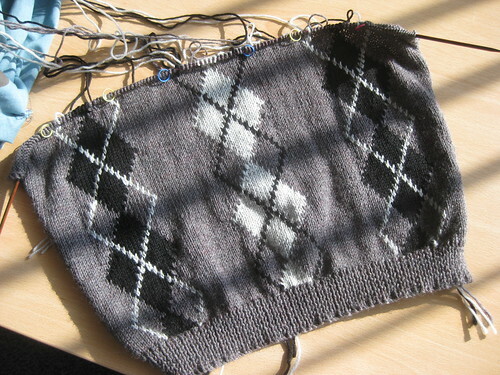 The only thing stopping me declaring this impossible is that once I get to the armpits I start decreasing rapidly, and I start the V at the same time which simplifies the colourwork as well as reducing the stitches.